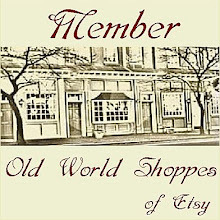 Not too many people know that by day, (or overnight!) I'm a freelance television engineer at a local television station in the city of Philadelphia; and I've been doing this particular job for over 10 years. 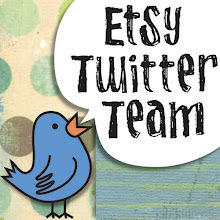 Unfortunately, lately, there hasn't been too much work and I've found myself crafting, blogging (writing) and tweeting with the extra time, which I have so thoroughly enjoyed. Because the track of the storm was predicted to arrive in the area in the late afternoon; we were given hotel rooms to insure our arrival at work the next morning... so here's a picture from the window of my hotel room. For the first time, I felt like a visitor in Philadelphia! This was an amazing view I had and I just couldn't get enough. 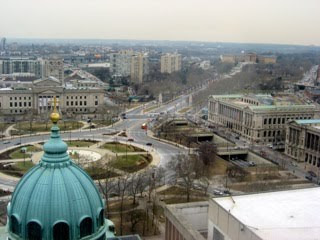 To the upper right of the pic, you'll see the Philadelphia Art Museum (those steps made famous in Rocky) and the road that leads up to it - Benjamin Franklin Parkway. 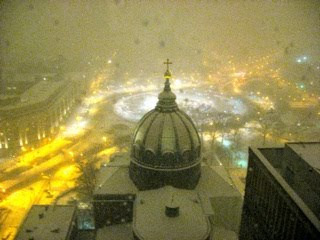 Clockwise around Logan Circle the buildings are - (right) The Free Library; the dome building is The Cathedral of the Basilica of Saints Peter & Paul; and across from the Cathedral is The Franklin Institute of Science Museum. It was amazing to me that there was very little traffic at 3pm... I think everyone was just trying to leave the city early! Now here's the same view from the window around 9pm. As you can see, the snow was starting to come down and things were starting to get a bit hairy. I was planning on taking another photo at 3am when I woke up but the white out condition was so terrible, it was impossible to make out a thing! I should just say that we were expecting to get, roughly, 18" of snow and more accumulation further south of the city and into my home state of New Jersey. We have a tendency to not believe what we hear all the time regarding snow accumulations but this storm was a big one... and when there is a hugh storm, the station wants to go on the air as early as possible. The station produces a daily, weekday, morning show which starts at 5am - so why not do this on Saturday!! Here are just some candid photos I took of the work day just prior to and during the morning. We went on the air at 5am - here are our two anchors (left) Ukee Washington & Liz Keptner just before the morning show began, reading over their scripts. 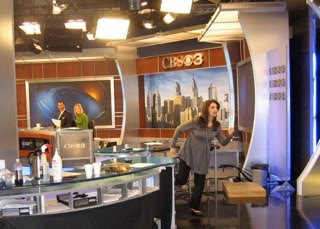 That terrific gal running to her desk is one of our Meteorologists, Maria LaRosa - hamming it up for the camera. This is a side view of the studio from the corner where my teleprompter station is located. Everyone was getting ready for the day long event... with our coffees in hand! Before we went on the air, there had been reports of such amazing snow accumulations all around the area - by show time, there had been at least 6" of snow in just under 4 hours. And with that snow came so many traffic accidents - the snow plow drivers are the hardest working people in this type of weather; also along with all the health care workers... they don't get snow days! 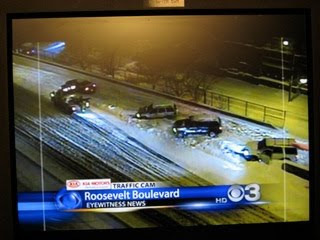 Our traffic reporter, Bob Kelly, was showing us one of many pile ups that happened - this is a picture from one of the traffic cameras of cars getting stuck. Apparently, the first car, (top, left) got stuck then the SUVs following trying to avoid hitting each other, all turned - but into an unplowed snowbank, leaving everyone stuck waiting for the tow trucks! Here's Bob describing the situation... I took this picture of my work station with the monitor that I watch to see what's going on over the air. The monitor on the right side of this photo is a computer screen showing, in different colors, the entire news show for that particular hour (we were on the air for over 8 hours that day) - it shows me all the stories that they will report or read during that show and the copy (text) that gets displayed for the teleprompter. I'm really starting to feel my age now, because when I first worked in television, all the copy was still being written on HUGH cue cards. Unfortunately, I was trying to be quick when taking the next picture and my poor buddy, Nico turned out just too blurry! Sorry! 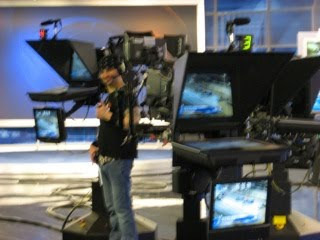 So, this is a blurry picture of my pal Nico, who was working as the Floor Director. 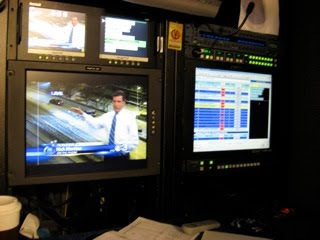 His job is to let the talent in the studio (which includes the reporters and anchors) know of any changes; to cue them when they are on the air; and to alert them of any changes that will ALWAYS happen - especially on a snow day broadcast. In this picture, he is standing next to a few cameras, while Bob Kelly was talking about the above traffic situation! This was later in the day, after the noon broadcast and everyone was getting ready for the next show. Unfortunately, I was unable to get photos of EVERYONE who was working behind the scenes; because for the few people you see in these pictures, there are 3x's that hard at work making sure everyone gets their news.